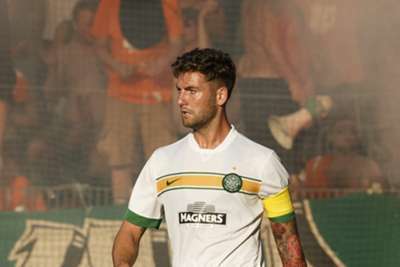 Celtic skipper Charlie Mulgrew has warned his team-mates not to let any awkwardness ruin their second chance in the UEFA Champions League. The Scottish Premiership champions are set to play Slovenia’s Maribor on Wednesday in the first leg of a Champions League play-off, with a spot in the group stage up for grabs, but Celtic will only be there due to a clerical error by Legia Warsaw. The Polish champions thumped Celtic 6-1 on aggregate in the third qualifying round of the Champions League but Legia fielded an ineligible player in the second leg and have since been denied the opportunity to play Maribor. But speaking on Thursday, Mulgrew urged Celtic to take advantage of their opportunity rather than focus on any feelings of embarrassment over how they got into the play-off. “We are grateful to get another chance,” the versatile midfielder and defender said. “It was disappointing how the two games (against Legia) went but rules are rules and we are happy to be back involved. “Maybe there is a wee bit [of embarrassment] but what can you do? You have to quickly get over that and get on with it. You can’t feel sorry for yourselves and be embarrassed at getting through. “It is not the way we wanted to get through but we have to get on with it. Legia defender Bartosz Bereszynski was the ineligible player at the centre of Celtic’s good fortune. The 22-year-old was sent off in Legia’s final UEFA Europa League group stage match last season and received an automatic three-game suspension. While Legia left Bereszynski out of both matches in their second qualifying round tie versus St Patrick’s of Ireland and the first leg against Celtic, the Polish club did not register him for the both second-round fixtures, which, according to UEFA, meant he had only served one game of his ban. Bereszynski’s appearance off the bench for the final four minutes against Celtic in Scotland saw UEFA award Mulgrew’s side an automatic 3-0 win, which meant they advanced on away goals. Legia have pledged to take their case to the Court of Arbitration for Sport after UEFA rejected their appeal. It is the second time in Mulgrew’s career that Celtic have benefited from such a mistake with the Glasgow-based club having been put into the UEFA Europa League group stage in 2011-12 after Switzerland’s Sion were found to have used ineligible players during their 3-1 aggregate qualifying win. “I was saying that to the boys, it is unreal,” Mulgrew said.